Moldavite - A green gem material formed by an asteroid impact. Moldavite: Two faceted specimens of moldavite. They both exhibit the bubbles and flow lines expected in a glass formed by a violent impact. Both of these gems measure 10 x 8 millimeters. The gem on the left weighs 2.20 carats, and the gem on the right weighs 1.75 carats. Moldavite (also called Bouteille Stone or vltavin) is a natural glass that is thought to have formed in the heat of an asteroid impact. This event occurred about 15 million years ago, and a splatter of hot glass formed a strewn field across central Europe. Moldavite is usually yellowish green, green, or greenish brown in color. It has been cut into faceted and cabochon gemstones since the mid-1800s. These are used in rings, earrings, necklaces, pins and other types of jewelry. Nice specimens of rough moldavite are popular with meteorite and mineral collectors. The extraterrestrial origin of moldavite gives it a special appeal to many people interested in new age, astrological, and spiritual practices. Uses A novelty gemstone. Specimens for meteorite and mineral collections. Many people believe that moldavite has certain healing properties and pay a premium price for it. There is no scientific evidence that moldavite has any medical effectiveness beyond being a placebo. Moldavite Area Map: This map shows the location of the Ries and Steinheim impact craters, along with generalized areas where moldavite has been found. The impacting bodies arrived from the southwest and formed the Ries and Steinheim craters when they hit. The force of the impact splashed moldavite and other debris to the northeast, forming a strewn field covering parts of Germany, Austria, and the Czech Republic. Moldavite is thought to have formed about 15 million years ago in the impact event that produced the Ries and Steinheim craters in southeastern Germany. An incoming asteroid is thought to have broken into two pieces that produced this pair of craters. The impacting bodies approached from the southwest. They hit with a high enough velocity to melt and splatter the target rock across a strewn field that includes portions of what is now the Czech Republic, Austria, and Germany. Most of the splatter solidified in the air and fell to Earth in the Czech Republic. Meteorite experts have named these materials "impactites." Moldavite is also considered to be a mineraloid because it is a naturally occurring, inorganic solid that does not have a crystalline structure. It solidified so quickly that atoms did not have enough time to organize themselves into minerals. Today moldavite is found in sediments of Middle to Upper Miocene age. It occurs as droplet-shaped particles of green to brown glass up to a few centimeters in diameter. Millions of pieces have been collected, mostly in the Czech Republic. Specimens are often severely etched into unusual shapes by acidic subsurface waters. Over the millions of years that have passed since the impact event which formed moldavite, much of the material has been eroded away, and much has been buried. As a result, moldavite is only found today in small areas of the original strewn field. These areas are shown on the accompanying map. Moldavite: A very high quality 86.5-carat moldavite specimen from the Czech Republic. The rich bottle-green color is typical of moldavites, and they are the most colorful of all impactites. Note the delicate feathering on the surface, which is likely the result of long-term erosion by water while the specimen lay buried. Extensive mining in the Czech Republic has depleted the supply of moldavites, and it is unusual to see pieces of this size and quality in today's marketplace. Photograph by Leigh Anne DelRay, copyright Aerolite Meteorites. Click to enlarge. 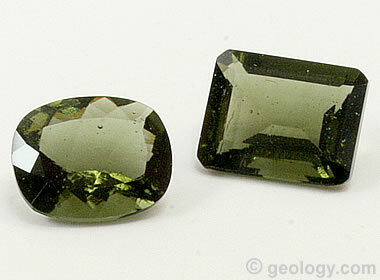 Most gem-quality moldavite is faceted or cut en cabochon and sold as a collector's gem. Moldavite jewelry should be worn cautiously because it is brittle and has about the same hardness as most man-made glasses (5 to 5.5). For that reason it is best used in earrings, pins and pendants that will not be subjected to impacts or abrasion. Moldavite has a durability that is too low to be a good gem for rings. When it is used in a ring, a metal bezel or other feature should protect the gem from impact and abrasion. Nice pieces of rough moldavite are also used in jewelry. Attractive droplet-shaped pieces are commonly wire-wrapped and made into pendants or earrings. Rough moldavite specimens with representative features are also purchased by meteorite and mineral collectors. The best specimens are often purchased by collectors for a much higher price than what they would have sold for if they were used in jewelry. Fake Moldavite: This gem measures 13 x 11 mm and weighs just over 6 carats. It was sold online as "moldavite" - but it is actually an imitation material. Anyone interested in spending serious money on moldavite should be knowledgeable and careful. Much of the moldavite offered for sale, especially online, is a green man-made glass and the man-made origin is not disclosed. Faceted moldavite and cabochons have been placed in jewelry since the late 1800s. Once moldavite’s extraterrestrial origin was known, the demand for moldavite gems grew much faster than the natural material could be found. Today, much of the rough and gemstone moldavite being sold are undisclosed fakes. If you are purchasing moldavite online, there is a very good chance that you will receive imitation material. That's what we received when we purchased the green faceted "moldavite" shown in the image above. We paid $29.49 for the 13 millimeter x 11 millimeter, 6.19-carat stone. If it was a genuine moldavite, it should have cost a lot more. It is an enormous stone for moldavite - most faceted stones cut from genuine moldavite are much smaller. The difference between “imitation” and “fake” is in the disclosure. “Imitations” are sold as such. “Fakes” are sold without disclosure. The seller might not realize that the material is “fake,” or the seller might know and is selling dishonestly to make money. Be careful when buying moldavite. If you are offered a faceted moldavite over two carats or any moldavite without eye-visible bubbles, there is a good chance that it is fake. Much of the moldavite being sold online today is offered for use as a “healing crystal” or for “metaphysical use.” Buyers believe that moldavite has beneficial properties, and that is the reason they seek it out. While some people say using moldavite this way is helpful, there is no scientific proof that moldavite has any medical effectiveness beyond that of being a placebo. But, when the seller fills this "prescription" with man-made glass, the buyer is definitely not getting his money's worth! 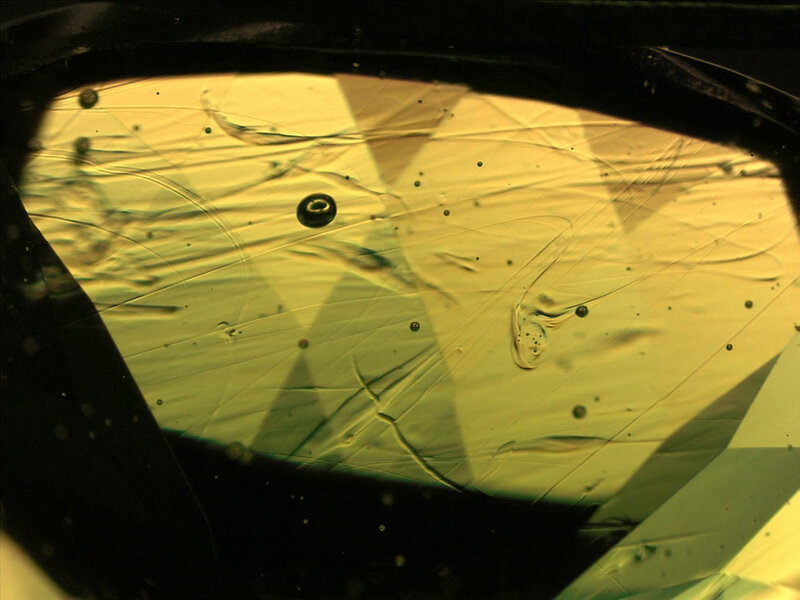 Moldavite Through a Microscope: In this photograph you are looking into a faceted moldavite through its pavilion facets. The large dark rounded inclusion that looks like a doughnut is an air bubble trapped in the moldavite. (You can see this bubble in the cushion-cut gem in the photo at the top of this article.) The smaller, dark, rounded inclusions are smaller bubbles. The chaos of streaks and swirls that pass through this view are flow lines in the moldavite. These are evidence that the molten material which solidified to form this moldavite was in chaotic motion immediately before solidification. 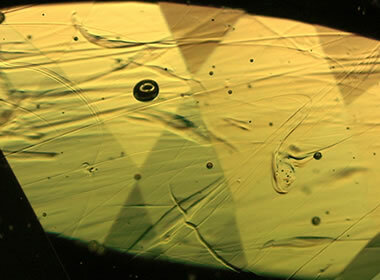 The bubbles and flow lines are two of the three important microscopic characteristics needed to make a positive identification as "moldavite." The third characteristic for identification is inclusions of lechatelierite. The high-relief, lens-shaped features in the moldavite at top left, lower right, and lower center are probably lechatelierite; as is the high-relief snake-like feature in lower center. This specimen is most likely moldavite, but submission to a professional gem laboratory is needed for a positive identification. Enlarge image. Unlike most gem materials that grow slowly over time in a quiet underground environment, moldavite formed in a burst of heat and energy produced by one of the most violent possible events - the impact of a large hypervelocity object with a planet. The rock in the impact area was instantly vaporized by the heat of the impact, then immediately condensed into a molten liquid, and then almost immediately solidified into an amorphous glass. The condensation and solidification were so fast that mineral crystals did not form, and gases were trapped in the glass. 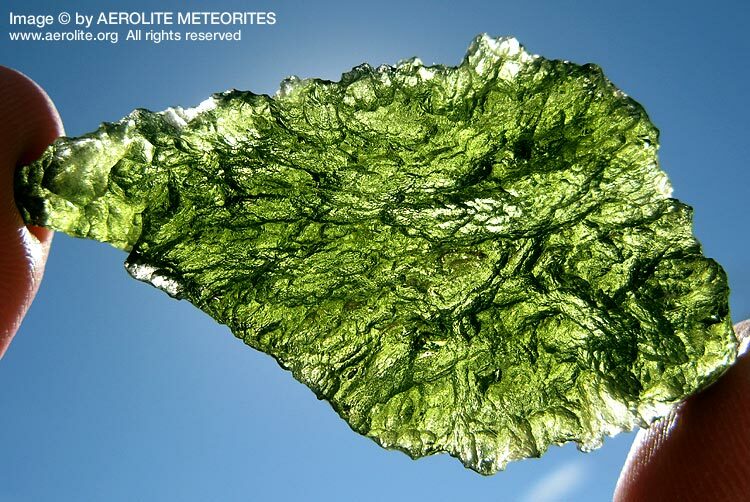 Most specimens of genuine moldavite contain trapped gas bubbles and flow structures that are visible under a magnification of 10x and often with the unaided eye. The gas bubbles are sometimes round, but more often they are elongate, stretched by the stress under which the glass cooled. The glass also contains flow structures of similar origin. Most genuine moldavite has an unusually low refractive index. It typically ranges between 1.47 and 1.51, much lower than most minerals and many man-made glasses. Numerical Modeling of Tektite Origin in Oblique Impacts: Natalia Artemieva, Elisabetta Pierazzo, and Dieter Stoffler, Bulletin of the Czech Geological Survey, Volume 77, Number 4, pages 303-311, 2002. Moldavites: A Review: Milan Trnka and Stanislav Houzar, Bulletin of the Czech Geological Survey, Volume 77, Number 4, pages 283-302, 2002. Moldavites: Natural or Fake? Jaroslav Hyrsl, Gems & Gemology, Volume 51, Number 1, 2015. Lechatelierite Mineral Data: a Webmineral.com article accessed in July, 2017. Moldavite is referred to by a number of incorrect names. These include: glass meteorite, bohemian chrysolite, false chrysolite, glass chrysolite. 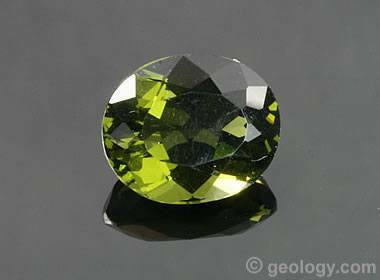 These names are misnomers because moldavite is not a meteorite or a chrysolite (a name used for a yellowish-green variety of the mineral olivine, which when of good clarity and color is known by the gemological name of peridot). Moldavite is without question one of the most frequently misspelled gem materials. Common misspellings include: moldivite, moldovite, moldevite, moldervite, moltavite, modavite, and muldavite. Fortunately, for the people who misspell, Google has learned that most people who use these misspellings as search queries are actually looking for information about “moldavite” and returns useful results.